I've been reading this forum for around a year and built my lunetta with your help, however I never got around to registering and posting something. Sooo, here's the suitcase lunetta, audio sample attached (EQ and a bit of reverb added). I don't have exact schematics for it, but here are the resources I've used to build it, hope it will be useful to someone. 1) 4067 based 16 step sequencer. Mostly relied on this schematic but used 4067 instead of 4051: https://hackaday.com/2015/02/23/logic-noise-the-switching-sequencer/. The outputs from 4040 to 4067 can be patched. Also there is a clock output to drive the second sequencer or something else. For 40106 range 20K pots and 1uF caps were used, it sounds a bit nicer that way. 2) 4051 based 8 step sequencer. 3) Passive 6 channel mixer. Used this website to build it:http://castlerocktronics.com/modular.html. 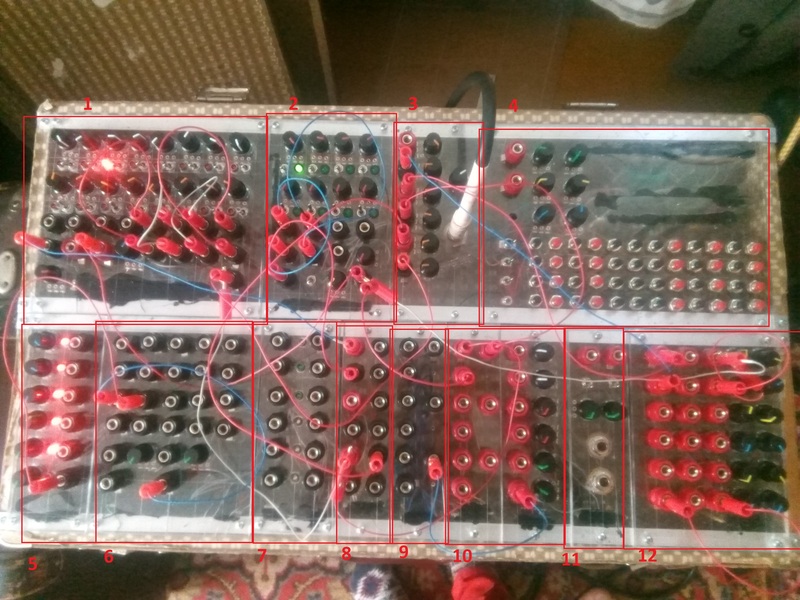 I thought that it could make cool waveshapes, but after building it I discovered that it does divides the frequency greatly, but it can be used to drive a VCO or modulate oscillators/sequencers. This one is quite interesting. Got the idea from https://www.parasitstudio.se/building-blog/cmos-workshop-part-2-square-wave-fuzz. It amplifies signals to logic levels and the cleans up the wave with 40106. The actual question I have is regarding attack/decay generation for a sequencer. It has a clock output, so I think I could use it as gate/trigger (I still don't fully understand this) for VCA, but the schematics are a bit too difficult for me. Are there any resources for this or simpler schematics? Well done. A very nice machine. Excellent build with a nice selection of modules. I like that you put a 4 octave synth with so many buttons in there. Your post gave me a boost to continue with my own lunetta in a suitcase. Do I understand it correct that you want to use an AD generator + a VCA clocked by the sequencer ? you want to use output Q4, at least if you connected it in the same way. If you only want to use squarewaves the VCA part can be very simple and an AD generator can be built easy too with a 555. I like the sound of your sample recording too. Thanks for finally signing up and posting.